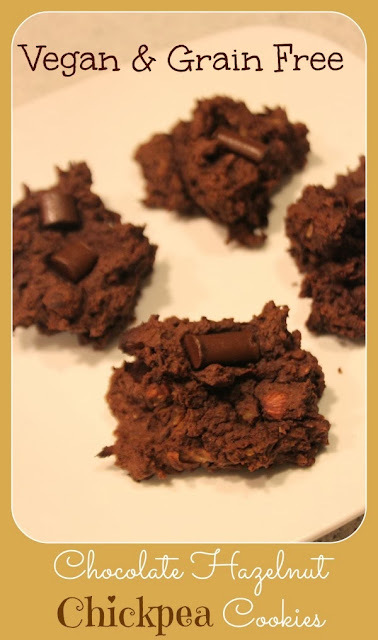 MamaEatsClean: Chocolate Hazelnut Chickpea Cookies - Vegan and Grain Free - And Good for Both of us! Chocolate Hazelnut Chickpea Cookies - Vegan and Grain Free - And Good for Both of us! I love when I make recipes that my whole family can eat. The combination of my Candida diet and food sensitivities and my daughter's long list of food sensitivities makes the overlap of our diets sometimes rare. Oh yeah, plus shes a kid. She doesn't necessarily love all my "adult" cooking. But this is one of those things that we can both eat. For breakfast if we want. Gotta love a cookies that are so packed full of super-foods you can eat them for breakfast. This is one of those times the "old" me would have scoffed and said why bother? Well, for many reasons. One of which they actually taste good. And I feel good. That's why. So. There. Old (tired, exhausted, depleted) me. I was actually eating a blow your mind black bean brownie yesterday topped with home-made chickpea ice cream. It is kind of ridiculous. Even to the new me. But my hubby actually said the words "this is delicious". So why not. Revise your expectations and then prepare to be impressed. Oh yeah. And some big news. I'm changing my blogging days again. I'm going down to one recipe a week (Wednesday) and one Sunday reflection. Christmas. Three kids. Severely teething baby toddler (how did that happen?). Seventeen month old that has only slept through the night 5 times since birth. New job. History of severe adrenal fatigue. Working on mind/body connection. Enough said. Time to pull back. Sorry if you are disappointed in me. But go here and find out why that can't change my mind. This is just something I need to do. Combine all ingredients (except nuts and chocolate chunks) in food processor. If you don't have one you can use a blender but it will require lots of manual stopping and scraping down the sides. Pulse until fully blended and chickpeas are fully pureed. It should have a smooth texture. Drop onto parchment paper in about 2 Tbsp portions. I formed mine into balls and then slightly flattened the top with the back of a fork. I also stuck one chocolate chunk on top of each one. A bit of a cheat and not completely Candida diet friendly. I did it for the kids. Really.